If you’re using Incredible Greens with juicing here are some ways to approach the issue. 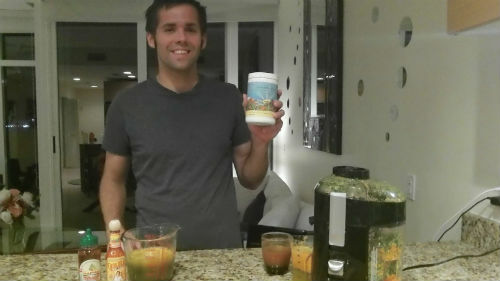 A common reason people buy Incredible Greens is to compliment their juicing. I’ve written frequently about juicing and juice fasts, but never specifically about how you ought to use a greens powder when going on one. Here’s a brief primer. Incredible Greens is something you ought to use when you don’t have the time or willpower to make regular juice but want to get as close as you can with minimal effort. It has the benefit of containing a wide variety of ingredients that you couldn’t otherwise put into your juice, but the downside of not being as fresh. It’s a tradeoff, and you ought to opt for the fresh juice whenever possible. If you read this blog then you know the emphasis I place on getting a wide variety of trace micro-nutrients, most of which are found in different plants. In the nutrition world phytonutrients are the equivalent of the weak-gauge boson: incredible important molecules that order the universe, but devilishly difficult to actually measure. This is no less true for greens powders and fresh juices. The biggest benefits of fresh juice is that the mashed up greens provide a high level of absorption of different phytonutrients within the plant. These typically degrade very quickly and are usually lost in the manufacturing process, even when a lot of care has been taken to preserve them. They’re very sensitive to heat and oxygen. Going from a green to a powder maintains most of the nutrients of the plant, and has the added benefit of quicker absorption of some plants that have a lot of their nutrients locked up within cell walls that get released when it’s ground up into a powder. But transporting food long distances and putting it through a dehydrator and food processor will result in *some* trace nutrients being lost. For most people most of the time this isn’t a big deal, but for someone going on a juice fast this won’t suffice if it constitutes the majority of your juice consumption. It has to be as fresh as possible.